Calico backpack with double cotton rope drawstrings. 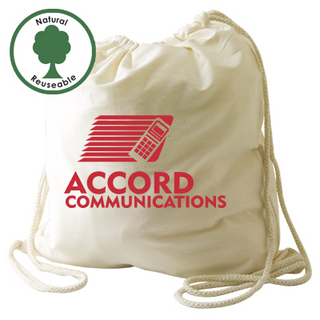 Ideal for environmental projects as calico (cotton) is a renewable resource and bags are continually re-used. Great for Environmentally Friendly, Event Merchandise, O Weeks, Product Launches, Seminars, Councils, Education, Healthcare and Recruitment.